Love this dental office! They are quick and easy. They take you in exactly at the time of your appointment. The staff in general is courteous and respectful. I am usually in and out when I’m inside the office. I really enjoy coming here and would definitely recommend it to friends and family. The entire staff are very kind and determined to make each of my visits as pain free as possible! I am so very thankful for Hanford Family Dental! I scheduled a cleaning and was very happy with the quickness and painlessness. I was fully expecting to be in pain walking out and it was the complete opposite. Been coming to this dentist since I moved to Hanford and they are AMAZING. They work around your schedule and with my hours the way they are it’s helpful for me. They were pretty gentle when they worked on me so that was a plus. Excellent staff too. Always so friendly! Thank you! I am terrified of dentists. The entire staff did an outstanding job of putting me at ease. My treatment was painless. I am thrilled to have found a dentist I feel comfortable with. I was extremely nervous and traumatized by previous childhood dentists but when I went to Dr. Raiyani at Hanford Family Dental Center, they made me feel very welcome, at ease and comfortable. Dr. was very gentle and made sure I wasn't in any pain. I'm happy to say they helped me get over my fear of going to the Dentist and I look forward to continuing my visits with my new Dental family. Over time, your teeth may need to be replaced due to accidental tooth loss, tooth decay, or other reasons. Tooth loss can negatively impact your smile and the function of your teeth. Replacing missing teeth with restorative treatment can bring back your confidence and improve your oral health. Dr. Nikunj Raiyani at Hanford Family Dental Center near Avenal, CA has expertise in providing natural-looking, high quality dental bridges, a tooth restoration option that is suitable for all ages. Dental bridges are one of multiple options for tooth restoration. They are common and have been used for a long time in dentistry to bridge the gap between teeth. Bridges can be made from a variety of materials, such as porcelain, zirconia, or silver amalgam. Due to advances in technology, bridges today can provide a natural-looking finish that makes them almost impossible to distinguish from your natural teeth. 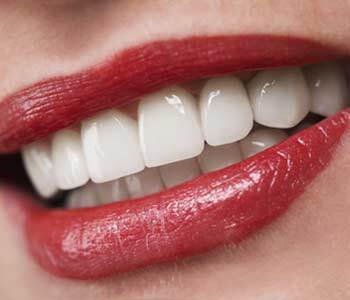 Other types of treatments for missing teeth include partial dentures and dental implants. Your dentist can advise you on the type of treatment that would work best to optimize your oral health and return your natural smile. The process of fitting a dental bridge usually requires at least two dentist visits. First, the dentist will create a mold of your teeth in the location that the tooth is missing. Then, a dental lab creates the dental bridge with crowns on each side of the replacement tooth. The crowns are cemented over the teeth adjacent to the gap, securing the bridge in place. Another option is to affix the bridge to dental implants. 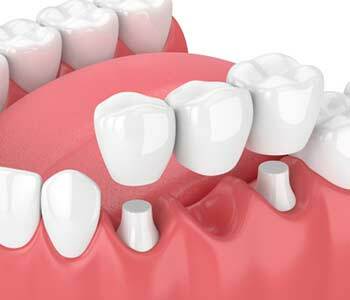 An implant is a post that is surgically embedded into your jawbone, which then secures the bridge. With a dental bridge securely in place, your ability to chew, speak, and bite normally will be restored, and your other teeth will not drift out of their proper alignment due to the missing tooth. You might be a good candidate for a dental bridge if you are missing between one and three teeth in a row. If you are missing a larger number of teeth, have gum disease, or the teeth surrounding the missing teeth are not healthy, you may need a different treatment option. Dental implants can only be used to support bridges if the jawbone where the implant would be placed is healthy and has enough volume to sustain the post. Your dentist will conduct a thorough exam to ensure that you are a good candidate for a bridge to help you decide on the best treatment option for your mouth. Dental bridges can last for many years with good home care. It is important to clean your bridge to prevent tooth decay, which can happen if food gets stuck between your natural teeth or beneath the false tooth. When this occurs, your natural teeth can weaken and no longer be able to support the bridge. Caring for your bridge at home requires the same type of care that is needed to keep your natural teeth healthy. You should brush after every meal, or at least twice a day, with a recommended toothpaste, and floss at least once per day between your natural teeth and under the bridge. A healthy diet that minimizes extra sugar and starches can also help keep your teeth and bridge healthy. Your oral health routine should also include regular hygiene visits to your dentist so your teeth can be professionally cleaned and checked. Dr. Nikunj Raiyani and his team at Hanford Family Dental Center, located near Avenal, CA, can consult with you about your tooth restoration options and determine whether you are a good candidate for a dental bridge. He will examine your teeth and gums and provide a professional assessment of your best treatment plan. Call Hanford Family Dental Center today at (559) 530-8080 for high quality tooth restoration with experienced, energetic staff who are committed to giving you a healthy, pain-free smile. Hanford, California dentist offers quality dental bridges as tooth replacement option! Come see your Hanford Dentist, Dr. Nikunj Raiyani, for all your family and cosmetic dental needs. We ensure your visit will be affordable & comfortable. Call Today! Dr. Nikunj Raiyani 4.8 out of 5 based on 191 Google reviews.